During a segment on the Watch What Happens Live After Show, Andy said, “Teresa came in hot at that reunion.” Teresa literally manhandled Andy at a previous reunion, so if he says “she came in hot” we believe him. Hold on to your seat, Andy! Margaret followed up with “Yeah Teresa came in hot….scary.” In all honesty, Teresa and her Christmas pageant dress came in PRETTTTY hot at the Season 4 reunion. It’s hard to imagine anything can top that. Although this has been a roller coaster season for the OG. It’s not hard to see why Teresa would be so intense going into the reunion. Jackie questioned her marriage early on in the season. She had the nerve to say, “Do you really feel like your husband would be in jail right now if you could control what he did?” OUCH. Jackie hit Teresa right where it hurts with that one. It was in that moment that Teresa wanted to destroy Jackie’s life nothing more to do with Jackie. However, the entire situation with Jackie stemmed from a Gorga family squabble. Earlier in the season, Teresa and sister-in-law Melissa were at odds. Teresa was fed up with her brother Joe Gorga not spending enough time with their aging father. Melissa insisted that Joe was his own person, but Teresa wanted Melissa to sway him to take action. Joe finally squashed the drama during Danielle Staub’s wedding vacation. All things considered, it’s great that the Gorga family was able to avoid imploding in Bimini. Nonna would be proud! Is it possible that The Marge was the latest victim of Teresa’s aggression? Margaret appeared to get on Teresa’s bad side during the last episode. Teresa is all about loyalty and Danielle has swayed Teresa to her team. DON’T DRINK THE KOOL-AID, TERESA. Avoid Danielle by all means necessary. Melissa, Jackie, and Margaret need to run for cover at the reunion. If Teresa really comes in hot, it won’t be pretty and she’ll make them crumble like a box of expired sprinkle cookies. 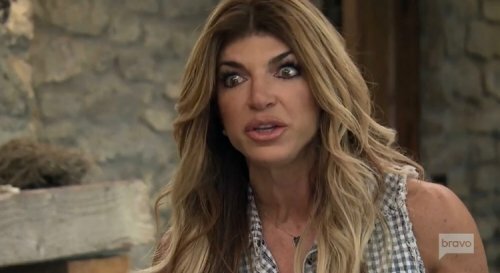 On the positive side, Teresa flipping out at the reunion will give us some GREAT GIFS to use. On the negative side, Teresa may completely remove all traces of Jackie from the planet after the reunion. TELL US – WHO DO YOU THINK TERESA WILL COME AT THE HARDEST DURING THE REUNION? ARE YOU ENJOYING THIS SEASON? DO YOU THINK DANIELLE IS A TRUE FRIEND TO TERESA?